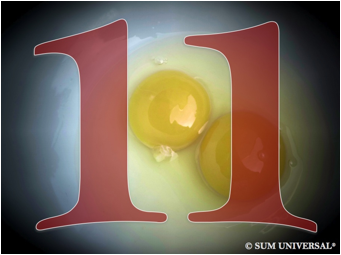 Number eleven embodies the qualities of a dual regulatory intensity. Since the number eleven is part of a new cycle, including the number ten, the qualities of number ten and one form here a new entity that has some sligthly different characteristics than the single-digit number one. The properties of number ten affect the properties of number one and vice versa. As a result, the number eleven is not so dominant, aggressive and independent as the number one, but more often manifests a regulatory and balancing force. Number eleven plays also an initiatory role, but of a twofold strength. In itself, this number has ambivalent qualities that serve according to the circumstances as a powerful unifier and on other occasions as a strong separator. Since number eleven is linked with fertility, this number embodies more of a human, personal quality, which is less driven by ego. It's a force that is more subtle and less dramatic than number one. In nature we find many manifestations for these functions. The most obvious is the human body with some duplicate organs, serving regulatory body functions and the creation of new life, such as the kidneys, lungs, and reproduction organs. These organs manifest a twofold strength within the body. The kidneys serve several essential, regulatory roles of the body: removal of waste products of metabolism and excess water, salt and urea from the blood, regulation of electrolyte and blood pressure, maintenance of acid-base balance, and secretion of a variety of hormones. The lungs' major function is to conduct the essential respiratory process and to act as a regulatory exchange filter for oxygen and carbon dioxide in the opposite direction. Just like the kidneys, lungs maintain also acid-base homeostasis, a relatively stable pH value within a closed system, and regulate the carbon dioxide (CO2) concentration. The sexual reproduction organs, the ovaries for females and testes for men, facilitate the process to combine the genetic material of two organisms into one. And one organism can even be separated into two. This separation is most recognizable with identical twins, which are created from a single fertilized egg that separates into two independent embryos. The chemical element that correlates with number eleven is the metallic element sodium. Sodium is a soft, silvery-white metal and belongs to the alkali-metals. It is the sixt most abundant element in Earth's crust and considered to be non-toxic. However, contact with the skin causes burns. Small amounts of metallic sodium react vigorously with water, whereas larger amounts react explosively. This reaction produces sodium hydroxide (NaOH) and hydrogen (H2). Due to its high reactivity it does not exist as a free element in nature, but abundantly in its compounds, for example as mineral rock salt (sodium chloride, NaCl), also known as table salt, which consists of about 40 percent sodium and 60 percent chloride. Sodium serves as an essential nutrient in small quantities in the human diet. It is naturally present in most foods. Sodium is needed to maintain the correct water and electrolyte balance of the body. It plays a pivotal role together with another alkali-metal potassium in the sodium-potassium exchange pump, also known as the Na+/K+ pump, within the cell membrane of humans and animals. The pump maintains the cell's electrolyte balance, and is responsible that nerve cells respond to stimuli and transmit impulses of sensation to the brain or spinal cord, and impulses from theses to the muscles and organs, and provides the energy for processes in the cell-membranes. To sum this up, sodium electrolytes maintain normal functions, such as heart rhythm, muscle contraction, and brain function, but is only required in very small amounts. Too much sodium intake has severe side effects and will harm the body. Sodium is an excellent reducing agent by loosing an electron, also called donating an electron, during an oxidation-reduction reaction with another chemical entity, like atoms, molecules, or ions. Reducings agents and oxidizing agents are responsible for the gradual destruction of materials, usually metals, through chemical reaction. The main use of sodium is with its compounds of chloride, hydroxide, and carbonate. Other uses for sodium are in the paper, photo, glass, fertilizer, soap, and textile industry. Liquid sodium is sometimes used as a heat transfer agent to cool nuclear reactors. Metallic sodium is also used to modify alloys and to purify molten metals. Sodium vapor lamps are used for street lighting in cities. Excited sodium emits a bright yellow light and is clearly visually identified through the D-line, also known as the "sodium doublet" line, in the solar emission spectrum. The D-line is actually two wavelengths of 589.0 and 589.6 nanometers close together.